This guide will walk you through uploading your first files to Chipmunk. Once you’ve uploaded your assets to Chipmunk, you can organize them into collections, tag them, comment on them, and update them as changes to the files are made—we’ll even keep track of previous versions for you. After filling in the requested information and clicking “Create” you’ll be sent into the collection. 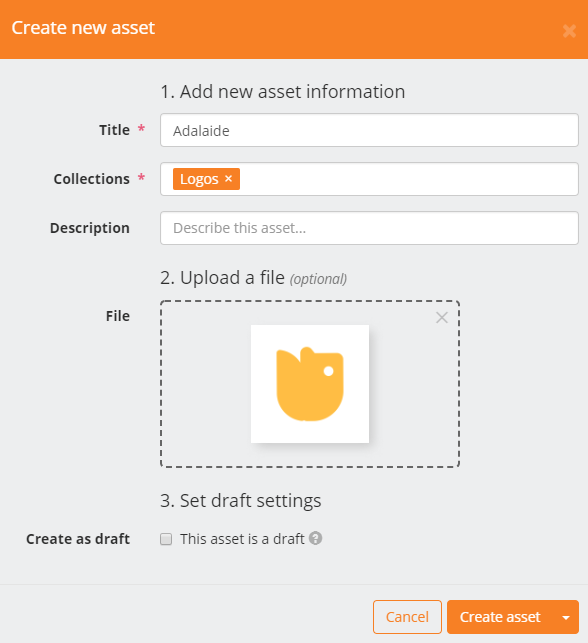 From here, you can upload new assets to your collection or add existing ones to it. You can simply drag files (including folders) into almost any screen inside Chipmunk to start creating assets. After either dragging the files into Chipmunk or selecting "New Asset" from the button and browsing to the file on your device you'll fill in the rest of the necessary information. The Title field will fill automatically with the file name. Make any necessary updates and (optionally) add a Description. If you're inside a collection, it will fill automatically in that field. Update Collections as necessary. If you're not creating the asset as a draft, you can submit to create the asset(s). More on Chipmunk's draft workflow. If you're browsing to select your files, you can toggle from Create asset to Create and upload another to upload multiple assets in a row. Once you're inside the asset, you can click the button next to the tag icon to add tags or click on the next to a tag to remove it. More on updating assets. When creating an asset in Chipmunk you must select at least one collection. You can add the asset to additional collections at any time. Start by hovering over the button, selecting “Add asset to collection" and finding the asset. You can also add an asset to a collection from inside the asset. Start by clicking the button next to the collection(s) an asset is in. 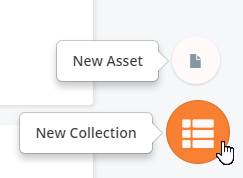 Search in the field that appears to add the asset to additional collections or click the button next to any collections you’d like to remove the asset from.